The Telegraph was born on July 7, 1982. Edwin Taylor, design director of Sunday Times, London designed the newspaper, setting fresh standards in design and editing that acquired many admirers and later, followers. It is today, eastern India’s largest circulated and read English newspaper. The Telegraph’s readership in Calcutta itself is greater than that of all its competitors combined. With an editorial policy that supports, among others, secularism and a free state, The Telegraph today is widely regarded as an emblem of everything a modern newspaper should be. Coupled with a long tradition of talented journalists, The Telegraph has always been in the thick of things — be it breaking news, unearthing scoops or investigating news. It takes up issues, makes the reader think and puts them in touch with the best of minds. The Telegraph, apart from being a thought leader is also an innovator. The Telegraph was the first to put sports news on the front page. It was the first newspaper in free India to dethrone the existing market leader — a feat that was accomplished within a mere 10 years. It was the first sectionalised newspaper, the first modular designed daily, the first to have pull-outs every day (Metro, Careergraph and other sub brands), the first general interest daily with separate sections on sports and business, the first with a separate leisure section, with crosswords and comics, the first with a 32-page colour magazine on Sundays (much earlier than leading national English dailies), the first to use run-of-press colour and the first in India to win prestigious global print awards like the SNAP and IFRA. The Telegraph is the first Indian newspaper to be available on WAP- enabled phones worldwide. 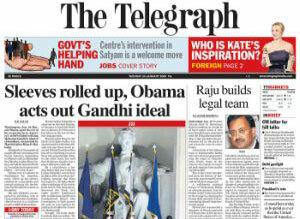 The Telegraph is also available as an e-paper at http://epaper.telegraphindia.com. There’s always something for everyone with The Telegraph supplements — city news in TT Metro on all days, career opportunities in Jobs on Tuesdays, children’s entertainment in Telekids on Wednesdays, education and career guidance in Careergraph on Thursdays, lifestyle, travel and general interest features on weekends with Personal TT on Saturdays, Graphiti, the colour magazine on Sundays. Moreover, the technology and knowledge section, Knowhow, now comes with the main paper. In addition to this, there are two weekly tabloids for Calcutta’s neighbouring areas – Salt Lake and Howrah. The Telegraph has recently launched a school edition – a sixteen-pager with a special section, Teen TT, to connect with young minds. T2 is the latest addition to The Telegraph stable. A snazzy, 16-page all colour tabloid which talks about fashion, food, films, television, arts, culture and everything young. This is available with The Telegraph every weekday in Calcutta.